This page contains descriptions of artifacts crafted by the divine smith for the gods, kings and heroes of myth--including palaces, chariots, animated statues and jewellery. In historical times some temples claimed to possess certain Hephaistian relics. The second "Works" page contains information on the armour and weapons crafted by the god. PALACES OF THE OLYMPIAN GODS The marble and gold palaces, cloisters and courtyards of the gods on Olympos were built by Hephaistos. THRONES OF THE OLYMPIAN GODS Before his return to Olympos Hephaistos sent golden thrones to the god of heaven, except for his mother Hera who was presented with a cursed one made of adamantine. TRIPODS OF THE OLYMPIAN GODS Hephaistos made golden, self-wheeling tripods to serve food at the feasts of the gods. PALACE OF HELIOS (Helius) The sun-god received his golden palace and throne from Hephaistos. PALACE OF ALKINOUS (Alcinous) The king of the blessed Phaiakes (Phaeacians) lived in a glorious palace built by the god Hephaistos. PALACE OF AEETES The palace of the king of Kolkhis was built by Hephaistos as a thank-offering to Aeetes' father Helios the sun-god, who had rescued him during the Giant-War. UNDERGROUND PALACE OF OINOPION (Oenopion) Poseidon had Hephaistos build an underground palace for King Oinopion of Khios as a reward for some service. TEMPLE OF APOLLON AT DELPHOI The third (mythical) temple of Apollon at Delphoi was constructed by Hephaistos out of bronze. It was adorned with animate golden singing maidens. CULT STATUE OF DIONYSOS AT TROY This cult statue and the chest it was stored in were said to have been forged for Zeus by Hephaistos, as a gift for Troy's first King Dardanos. In historical times it was a relic held by the Akhaian city of Patrai. MAIDENS OF HEPHAISTOS Hephaistos crafted for himself animate maidens out of gold to serve as his personal household attendants. WATCHDOGS OF AEETES The palace of the Kolkhian king Aeetes was guarded by a pair of animate, gold and silver watchdogs, crafted by Hephaistos at the request of the king's father Helios. BULLS OF AEETES Hephaistos created a pair of bronze, fire-breathing bulls for the Kolkhian king Aeetes. A part of the bounty reward bestowed upon the king for his father Helios' assistance during the Giant-War. TALOS THE BRONZE GIANT Zeus commissioned this animate bronze giant, named Talos, from Hephaistos, as a gift for his Kretan bride Europa. It patrolled the island later ruled by her son King Minos. SINGERS OF APOLLON AT DELPHOI Hephaistos created animate golden singing maidens to adorn the third mythical, bronze temple of Apollon at Delphoi. EAGLE OF PROMETHEUS The eagle which tortured Prometheus was, according to some, a metal automoton forged by Hephaistos. HORSES OF THE KABEIROI (Cabeiri) Hephaistos forged from brass and iron a set of animate, fire-breathing horses to pull the chariot of his sons the Kabeiroi. PANDORA (FIRST WOMAN) Zeus commanded Hephaistos to mold the first woman, Pandora, out of clay as a curse upon mankind. BOAT OF HELIOS The golden boat of the sun-god Helios, on which he travelled at night back to his rising place in the East, was said to have been forged for the god by Hephaistos. CHARIOT OF HELIOS The golden sun-chariot of Helios was sometimes said to have been forged by Hephaistos. CHARIOT OF THE KABEIROI (Cabeiri) Hephaistos crafted for his Kabeiroi sons an adamantine chariot drawn by four animate, metalic horses. CHARIOT OF ARES The god of war Ares received his chariots from the forge of Hephaistos. CHARIOT OF APHRODITE Hephaistos presented Aphrodite with a golden chariot as bridal gift. CROWN OF ARIADNE Dionysos received a fabulous jewelled crown from Hephaistos as a wedding-gift for his bride Ariadne. CROWN OF PANDORA The first woman Pandora was adorned with a crown by Hephaistos, after he had crafted her out of clay. NECKLACE OF HARMONIA Harmonia, the daughter born to Aphrodite from her affair with Ares, was presented with a fabulous cursed necklace by Hephaistos at her marriage to Kadmos. The necklace doomed both her and her descendants. WINE-BOWL OF MENELAOS (Menelaus) When Menelaos and Helene visited the court of the king of Sidon on their return from Troy, they were presented with a golden wine-mixing bowl (or krater), said to have been crafted by the god Hephaistos. WINE-JAR & URN OF AKHILLEUS (Achilles) At the funeral of Akhilleus, the goddess Thetis provided a golden wine-jar (amphiphoreus) for the internment of his ashes. She had received the jar as a gift from Dionysos, who in turn had had it forged for him by Hephaistos. WINE-BOWL OF PRIAMOS (Priam) A golden wine-chalice (krater) owned by King Priamos of Troy. It was forged by Hephaistos for Zeus, as a part of the bride-price he paid for Aphrodite prior to their marriage. Zeus in turn gave it as a gift to his son Dardanos, the founding king of Troy, to be passed down as an heirloom by each generation of rulers. WINE-BOWLS OF EUENOS (Evenus) A pair of silver wine-bowls (krater) owned by King Euenos of Lemnos. They were crafted by Hephaistos as a wedding gift for Dionysos at his marriage to Ariadne on Naxos, and passed on to their son Thoas and his descendants. Akhilleus later won it in the payment of a ransom. WINE-BOWL OF TELEPHOS (Telephus) A bronze wine-bowl (krater) owned by King Telephos of Teuthrania, an Trojan Ally in their war against the Greeks, was said to have been crafted by Hephaistos. The Lykian city of Patara claimed to possess it as a relic in historical times. CHAINS OF ARES & APHRODITE Hephaistos crafted thse light, invisible chains out of adamantine to trap his adulterous wife Aphrodite in the arms of her lover Ares. CHAINS OF PROMETHEUS Prometheus was bound to Mount Kaukasos with adamantine chains forged by Hephaistos at the command of Zeus. SCEPTRE OF AGAMEMNON The royal sceptre of the house of Pelops was a gift from Zeus, forged by Hephaistos, and bestowed upon the king in his capacity as the overlord of the Peloponnesian kingdoms. The sceptre was passed down to Pelops' son Atreus, and grandson Agamemnon. The Phokian town of Khaironeia claimed to possess this relic in historical times. GRAPE-VINE OF LAOMEDON Zeus gave King Laomedon of Troy a magical, golden grape-vine as compensation for his son Ganymedes. It was forged by Hephaistos, and grew golden grapes and leaves as if it were a living plant. RATTLES OF HERAKLES (Heracles) When Herakles was sent to rid the Stymphalian lake of its birds, Athena obtained a set of bronze rattles from Hephaistos to assist the hero in his labour. AXE OF POLYTEKHNOS (Polytechnus) The mythical carpenter Polytekhnos received his craftsman's axe from the god Hephaistos. "Poets have sung, and the tradition of men has followed them, that Hephaistos made many works of art, but none is authentic except only the scepter of Agamemnon. However, the Lykians in Patara show a bronze bowl in their temple of Apollon, saying that Telephos dedicated it and Hephaistos made it, apparently in ignorance of the fact that the first to melt bronze were the Samians Theodoros and Rhoikos. The Akhaians of Patrai assert indeed that Hephaistos made the chest brought by Eurypylos from Troy, but they do not actually exhibit it to view. In Kypros is a city Amathos, in which is an old sanctuary of Adonis and Aphrodite. Here they say is dedicated a necklace given originally to Harmonia . . . probably the scepter is the only [genuine] work of Hephaistos." "When the light of the flaming sun went under they [the Olympian gods] went away each one to sleep in his home where for each one the far-renowned strong-handed (periklytos amphigueeis) Hephaistos had built a house by means of his craftsmanship and cunning." "She [Hera] went into her chamber, which her beloved son Hephaistos had built for her, and closed the leaves in the door-posts snugly with secret door-bar, and no other of the gods could open it." "[Hera addresses Zeus :] ‘If this is your wish [to lie with me now], then there is my chamber, which my beloved son Hephaistos has built for me, and closed the leaves in the door-posts snugly. We can go back there and lie down, since bed is your pleasure.’"
"Thetis of the silver feet came to the house of Hephaistos imperishable, starry, and shining among the immortals, built in bronze for himself by the god of the dragging footsteps. She found him sweating as he turned here and there to his bellows busily." "[The gods] all assembling into the house of Zeus cloud gathering took places among the smooth-stone cloister walks which Hephaistos had built for Zeus the father by his craftsmanship and contrivance." "The palace of Aphrodite, which her lame consort Hephaistos had built for her when he took he as his bride from the hands of Zeus. They [Hera and Athene] entered the courtyard and paused below the veranda of the room where the goddess slept with her lord and master." "The palace of Sol [Helios the Sun] rose high aloft on soaring columns, bright with flashing gold and flaming bronze; the pediments were clothed with sheen of ivory; the double doors dazzled with silver--and the artistry was nobler still. For Mulciber [Hephaistos] had engraved the world's great orb, the seas that ring the world, the sky that hangs above; and in the waves the Sea-Gods (Di Caerulei) dwelt . . . On the land people and cities, woods and beasts were graven, Flumina (Rivers) and Nymphae and Rural-Deities (Numina Ruris), and, set above them, the bright signs of heaven [i.e. the Zodiac], in glory shining, six upon each door." "[Hera bribes Hypnos to put Zeus to sleep :] ‘I will give you gifts; a lovely throne, imperishable forever, of gold. My own son, he of the strong arms, Hephaistos, shall make it with careful skill and make for your feet a footstool on which you can rest your shining feet when you take your pleasure.’"
"Hephaistos, when he was born, was thrown down by Hera. In revenge he sent as a gift a golden chair with invisible fetters. When Hera sat down she was held fast." "When Volcanus [Hephaistos] had made golden thrones for Jove [Zeus] and the other gods, he made one of adamant for Juno [Hera], and as soon as she sat down she suddenly found herself hanging in the air." "[Hephaistos] was working on twenty tripods which were to stand against the wall of his strong-founded dwelling. And he had set golden wheels underneath the base of each one so that of their own motion they could wheel into the immortal gathering, and return to his house: a wonder to look at. These were so far finished, but the elaborate ear handles were not yet on. He was forging these, and beating the chains out." "Tripods, gifted with wills of their own, attend the banquets of the gods also . . . Hephaistos, adorned the banquet of the gods, encompassed them with miracles." "Odysseus went on his way to the noble place of Alkinous [king of the Phaiakians] . . . A radiance like that of the sun or moon played over the king's high palace. Walls of bronze ran this way and that, from the entrance to the further end, and these were topped with a frieze of cyanus [dark-blue enamel]. Golden doors closed the palace in, and silver posts rose above the threshold; the lintel was of silver, the door-handle was of gold. Each side of the door were gold and silver watchdogs [possibly griffins], deathless for ever and unageing, which Hephaistos with his wit and cunning had fashioned as guardians for the great house." "At the entrance [of the palace of Aeetes king of Kolkhis] they [the Argonauts] paused for a moment to marvel at the king's courtyard with its wide gates, the rows of soaring columns round the palace walls, and high over all the marble cornice resting on triglyphs of bronze. They crossed the threshold of the court unchallenged. Near by, cultivated vines covered with greenery rose high in the air and underneath them four perennial springs gushed up. These were Hephaistos' work. One flowed with milk, and one with wine, the third with fragrant oil, while the fourth was a fountain of water which grew warm when the Pleiades set, but changed at their rising and bubbled up from the hollow rock as cold as ice. Such were the marvels that Hephaistos the great Engineer had contrived for the palace of Kytaian Aeetes . . . as a thank-offering to Helios (the Sun) [i.e. the father of Aeetes], who had taken him up in his chariot when he sank exhausted on the battlefield of Phlegra [in the battle between the gods and Gigantes]." "[Oinopion king of Khios] blinded him [the giant Orion] and tossed him out . . . [But] immediately [after he was healed] he started back to confront Oinopion. But Poseidon had provided Oinopion with a house beneath the earth, built by Hephaistos." "The [mythical] third temple [of Apollon at Delphoi] was made of bronze, seeing that Akrisios made a bedchamber of bronze for his daughter, the Lakedaimonians still possess a sanctuary of Athena of the Bronze House . . . So it would not be unlikely that a temple of bronze was made for Apollon. The rest of the story I cannot believe, either that the temple was the work of Hephaistos, or the legend about the Golden Singers, referred to by Pindaros in his verses about this bronze temple :--‘Above the pediment sang Khryseiai Keledones (Golden Charmers).’ These words, it seems to me, are but an imitation of Homer's account of the Seirenes. Neither did I find the accounts agree of the way this temple disappeared. Some say that it fell into a chasm in the earth, others that it was melted by fire." "When Troy was captured, and the Greeks divided the spoils, Eurypylos the son of Euaimon got a chest. In it was an image of Dionysos, the work, so they say, of Hephaistos, and given as a gift by Zeus to Dardanos [i.e. the first king of Troy]." "Poets have sung, and the tradition of men has followed them, that Hephaistos made many works of art, but none is authentic except only the scepter of Agamemnon . . . The Akhaians of Patrai assert indeed that Hephaistos made the chest brought by Eurypylos from Troy, but they do not actually exhibit it to view." "The high chariot [of Helios the Sun], Vulcanus' [Hephaistos'] masterwork. Gold was the axle, gold the shaft, and gold the rolling circles of the tyres; the spokes in silver order stood, and on the harness patterns of gorgeous gems and chrysolites shone gleaming in the glory of Sol [Helios]." "A lovely bed, hollow, forged by the hands of Hephaistos, of precious gold and winged, carries him [Helios the Sun], as he sleeps soundly, over the waves on the water's surface from the place of the Hesperides [the place of his setting in the West] to the land of the Aithiopes [the place of his rising in the East]." "Where, in the west, is the bowl wrought by Hephaistos, the bowl of thy sire [Helios], speeding wherein he crosseth the mighty, swelling stream [Okeanos] that girdleth earth, fleeing the gloom of holy Nyx (Night) of sable steeds." "Venus [Aphrodite] now despaired of a successful search for her by earthly means, and she made for heaven. She ordered her carriage to be prepared; Vulcanus [Hephaistos] had lovingly applied the finishing touches to it with elaborate workmanship, and had given it to her as a wedding-present before her initiation into marriage. The thinning motion of his file had made the metal gleam; the coach's value was measured by the gold it had lost. Four white doves . . . submitted to the jewelled yoke." "A job was being hurried on [by the Kyklopes in the service of Hephaistos] for Mars [Ares]--a chariot with swift wheels, such as he rides in to rouse up men and nations." "Their [the Kabeiroi's] eyes flashed out their own natural sparks, which came from the red smoky flame of their father Hephaistos. They rode in a car of adamant; a pair of colts beat the dust with rattling hooves of brass, and they sent out a dry whinnying from their throats. These father Hephaistos had made with his inimitable art, breathing defiant fire between their teeth . . . Eurymedon [one of the Kabeiroi] drove and guided the fiery mouths of the ironfoot steeds with a fiery bridle." "[Hephaistos] took up a heavy stick in his hand, and went to the doorway limping. And in support of their master moved his attendants. These are golden, and in appearance like living young women. There is intelligence in their hearts, and there is speech in them and strength, and from the immortal gods they have learned how to do things. These stirred nimbly in support of their master, and moving to where Thetis sat in her shining chair." "[On] each side of the door [of the palace of King Alkinous of the Phaiakians] were gold and silver watchdogs [possibly griffins], deathless for ever and unageing, which Hephaistos with his wit and cunning had fashioned as guardians for the great house." "Aeetes promised to give it [the Golden Fleece] to him [Iason], if Jason by himself could yoke his bronze-hooved bulls, two immense wild beasts which Hephaistos had given him, with hooves of bronze and fire shooting from their mouths." "He [Hephaistos] had also made for him [Aeetes king of Kolkhis] Bulls with feet of bronze [the Khalkotauroi] and bronze mouths from which the breath came out in flame, blazing and terrible. And he had forged a plough of indurated steel, all in one piece." "These father Hephaistos had made with his inimitable art, breathing defiant fire between their teeth, like the pair of brazenfooted bulls which he made for Aietes the redoubtable ruler of the Kolkhians, with hot collars and burning pole." 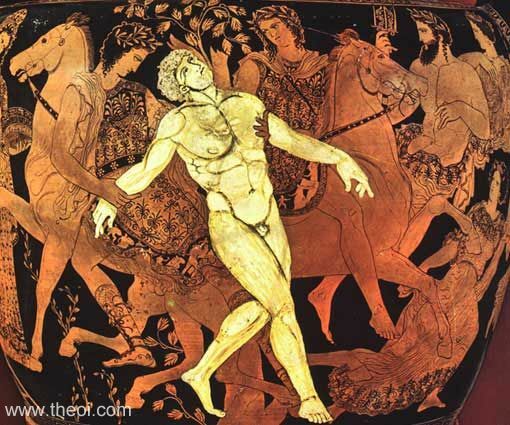 "Others hold that he [the bronze giant Talos] was given to Minos by Hephaistos and was a bull. He had one blood vessel that extended from his neck down to his ankles, the lower end of which was held in place by a bronze stud. This Talos would run round the island [of Krete] three times a day as a security patrol." "The [mythical first bronze] temple [of Apollon at Delphoi] was the work of Hephaistos, or the legend about the Golden Singers, referred to by Pindaros in his verses about this bronze temple :--‘Above the pediment sang Khryseiai Keledones (Golden Charmers).’"
"He [Zeus] sent an eagle to him [Prometheus chained on Mount Kaukasos] to eat out his liver which was constantly renewed at night . . . many point out it [the eagle] was made by the hands of Volcanus [Hephaistos] and given life by Jove [Zeus]." "Their [the Kabeiroi's] eyes flashed out their own natural sparks, which came from the red smoky flame of their father Hephaistos. They rode in a car of adamant; a pair of colts beat the dust with rattling hooves of brass, and they sent out a dry whinnying from their throats. 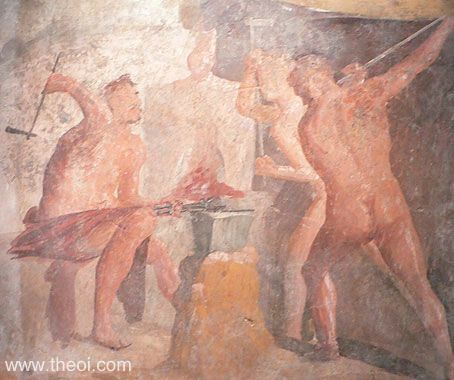 These father Hephaistos had made with his inimitable art, breathing defiant fire between their teeth, like the pair of brazenfooted bulls which he made for Aietes the redoubtable ruler of the Kolkhians, with hot collars and burning pole. Eurymedon [one of the Kabeiroi] drove and guided the fiery mouths of the ironfoot steeds with a fiery bridle; in his right hand he held a Lemnian spear made on his father's anvil, and by his wellmade thigh hung a flashing sword--if a man picked up a small stone in his fingertips and struck it against the fire-grained surface of the sharp blade, sparks flashed of themselves from the steel. Alkon grasped a fiery bolt in one hand." "I [Hephaistos] wrought many intricate things; pins that bend back, curved clasps, cups, necklaces." "[Dionysos addresses Ariadne :] ‘I will create a monument of you and your crown, which Volcanus [Hephaistos] gave Venus [Aphrodite] and she gave you.’ He does what he said, and turns its nine gems to fires, and the golden crown glitters with nine stars [as the constellation Corona]." "[Hephaistos moulded Pandora out of clay and then] [Athene] put upon her [Pandora's] head a crown of gold which the very famous Limping God [Hephaistos] made himself and worked with his own hands as a favor to Zeus his father. On it was much curious work, wonderful to see; for of the many creatures which the land and sea rear up, he put most upon it, wonderful things, like living beings with voices: and great beauty shone out from it." "Kadmos gave Harmonia [as a wedding gift] a robe and the necklace fashioned by Hephaistos, which some say Hephaistos gave to Kadmos." "Eriphyle [his mother] had accepted the golden necklace in return for working the destruction of his father [Amphiaraus], but also because she had received a robe as reward for securing the death of her son. For Aphrodite, the tale is told, in ancient times had given both the necklace and a robe as presents to Harmonia." "Poets have sung, and the tradition of men has followed them, that Hephaistos made many works of art, but none is authentic except only the scepter of Agamemnon . . . In Kypros is a city Amathos, in which is an old sanctuary of Adonis and Aphrodite. Here they say is dedicated a necklace given originally to Harmonia, but called the necklace of Eriphyle, because it was the bribe she took to betray her husband. It was dedicated at Delphoi by the sons of Phegeos (how they got it I have already related in my history of Arkadia ), but it was carried off by the tyrants of Phokis. However, I do not think that it is in the sanctuary of Adonis at Amathos. For the necklace at Amathos is composed of green stones held together by gold, but the necklace given to Eriphyle was made entirely of gold, according to Homer, who says in the Odyssey :--‘Who received precious gold, the price of her own husband.’ . . . But Homer does not say that the necklace given to Eriphyle was of gold varied with stones." "From their [Aphrodite and Ares' adulterous] embrace Harmonia was born, and to her Minerva [Athene] and Volcanus [Hephaistos] gave a robe [and necklace] ‘dipped in crimes' as a gift. Because of this, their descendants are clearly marked as ill-fated." "For thou wast wearing, Argia [at her marriage to Polyneikes], the ill-starred ornament of thy husband's giving, the dread necklace of Harmonia. Far back the story runs, but I will pursue the well-known tale of woes, whence came it that a new gift had such terrible power. The Lemnian [Hephaistos], so they of old believed, long time distressed at Mars' [Ares'] deceit and seeing that no punishment gave hindrance to the disclosed armour, and the avenging chains removed not the offence [of his affair with Hephaistos' then wife Aphrodite], wrought this for Harmonia on her bridal day to be the glory of her dower. Thereat, though taught mightier tasks, the Cyclopes labour, and the Telchines [craftsmen of evil magic] famed for their handiwork helped in friendly rivalry of their skill; but for himself the sweat of toil was heaviest. There forms he a circlet of emeralds glowing with a hidden fire, and adamant stamped with figures of ill omen, and Gorgon eyes, and embers left on the Sicilian anvil from the last shaping of a thunderbolt, and the crests that shine on the heads of green serpents; then the dolorous fruit of the Hesperides and the dread gold of Phrixus' fleece; then divers plagues doth he intertwine, and the king adder snatched from Tisiphone's grisly locks, and the wicked power that commends the girdle [of Aphrodite]; all these he cunningly anoints about with lunar foam, and pours over them the poison of delight. Not Pasithea, eldest of the gracious sisters, nor Decor (Charm) nor the Idalian youth did mould it, but Luctus (Grief), and all the Irae (Passions), and Dolor (Anguish) and Discordia (Discord), with all the craft of her right hand. The work first proved its worth, when Harmonia's complaints turned to dreadful hissing, and she bore company to grovelling Cadmus, and with long trailing breast drew furrows in the Illyrian fields [i.e. the pair were turned into serpents in Illyria]. Next, scarce had shameless Semele put the hurtful gift about her neck, when lying Juno [Hera] crossed her threshold. Thou too, unhappy Jocasta, didst, as they say, possess the beauteous, baleful thing, and didst deck thy countenance with its praise--on what a couch, alas! to find favour; and many more beside. Last Argia shines in the splendour of the gift, and in pride of ornament and accursed gold surpassed her sister's mean attiring. The wife of the doomed prophet [Eriphyle wife of Amphiaraus] beheld it, and at every shrine and banquet in secret cherished fierce jealousy, if only it might be granted her to possess the terrible jewel, nought profited, alas!" "Aphrodite wishing to delight Ares in the deep shrewdness of her mind, clasped a golden necklace [and presented it at a gift to their daughter Harmonia at her marriage to Kadmos] showing place about the girl's blushing neck, a clever work of Hephaistos set with sparkling gems in masterly refinement. This he had made for his Kyprian bride, a gift for his first glimpse of Archer Eros (Love) [N.B. Aphrodite, the wife of Hephaistos, conceived Eros through her adultery with the god Ares]. For the heavyknee bridegroom always expected that Kythereia would bear him a hobbling son, having the image of his father in his feet. But his though was mistaken; and when he beheld a whole-footed son [Eros] brilliant with wings like Maia's son Hermes, he made this magnificent necklace. It was like a serpent with starspangled back and coiling shape. For as the twoheaded amphisbaina in very sooth winds the coils between and spits her poison from either mouth, rolling along and along with double-gliding motion, and head crawling joins with head while she jumps about with twirling waves of her back sideways: so that magnificent necklace twisted shaking its crooked back, with its pair of curving necks, which came to meet at the midnipple, a flexible twoheaded sperent thick with scales; and by the curving joints of the work the golden circle of the moving spine bent round, until the head slid about with undulating movement and belched a mimic hissing through jaws. With the two mouths on each side, where is the beginning and the end, was a golden eagle that seemed to be cutting the open air, upright between the serpent's heads, high-shining with fourfold nozzle of the four wings. One wing was covered with yellow jasper, one had the allwhite stone of Selene [moonstone], which fades as the horned goddess wanes, and waxes when Mene [Selene] newkindled distils her horn's liquid light and milks out the self-gotten fire of Father Helios. A third had the gleaming pearl, which by its gleam makes the gray swell of the Erythraian Sea sparkle shining. Right in the middle of the other, the Indian agate spat out its liquid light, gently shining in bright beauty. Where the two heads of the serpent came together from both sides, the mouths gaped wide and enclosed the eagle with both their jaws, enfolding it from this side and that. Over the shining front, rubies in the eyes shot their native brilliancy, which sent forth a sharp gleam, like a fiery lamp being kindled. Proud with the manifold shapes of stones was a sea, and an emerald stone grass-green welcomed the crystal adjoining like the foam, and showed the image of the white-crested brine becoming dark; here all clever work was fashioned, here all the brinebred herds of the deep sparkled in shining gold as though leaping about, and many a supple traveller danced halfseen, the dolphin skimming the brine which waggled its mimic tail self-moved; flocks of many-coloured birds--you might almost think you heard the windy beat of their flapping wings, when Kythereia gave the glorious necklace to her girl, golden, bejewelled, to hang by the bride's neck." "Lemnian Hephaistos held out a curious necklace of many colours, new made and breathing still of the furnace, poor hobbler! For he had already, though unwilling, rejected his former bride Aphrodite, when he spied her rioting with Ares." "[Menelaos addresses Telemakhos :] ‘Of all the treasures stored in my house I will give you the loveliest and he richest. I will give you a noble krater (mixing-bowl); it is silver all through and rimmed with gold; Hephaistos made it; King Phaedimos, king of Sidon, gave it me when his house received me during my voyage home [from Troy].'" 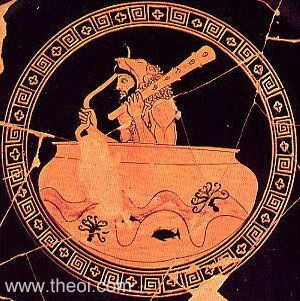 "Your [Akhilleus'] mother [Thetis] gave us [the Greeks] a golden urn that had two handles (amphiphoreus)--given her, she said by Dionysos, and made by renowned Hephaistos himself. In this your bones now lie, Akhilleus, mingled with those of dead Patroklos." "[At the funeral of Akhilleus :] So his companions groaning gathered up his [Akhilleus'] bones [from the pyre], and in a silver casket laid massy and deep, and banded and bestarred with flashing gold; and Nereus' daughters shed ambrosia over them, and precious nards for honour to Akhilleus: fat of kine and amber honey poured they over all. A golden vase his mother gave, the gift in old time of the Wine-god [Dionysos], glorious work of the craft-master Fire-god [Hephaistos], in the which they laid the casket that enclosed the bones of mighty-souled Akhilleus." "In his hands a chalice deep and wide he [Priamos] raised, and Memnon in all love he pledged in that huge golden cup (krater), a gift of Gods; for this the cunning God-smith [Hephaistos] brought to Zeus, his masterpiece, what time the mighty in power to Hephaistos gave for bride Kypris [Aphrodite]; and Zeus on Dardanos his godlike son bestowed it, he on Erikhthonios; Erikhthonios to Tros the great of heart gave it, and he with all his treasure-store bequeathed it unto Ilos, and he gave that wonder to Laomedon, and he to Priamos, who had thought to leave the same to his own son. Fate ordered otherwise." "[At the funeral games of Akhilleus :] Thetis sable-stoled gave to their glad hands two great silver bowls (kraters) those which Euneus, Jason's warrior son in sea-washed Lemnos to Akhilleus gave to ransom strong Lykaon from his hands. These had Hephaistos fashioned for his gift to glorious Dionysos, when he brought his bride divine to Olympos, Minos' child far-famous [Ariadne], whom in sea-washed Dia's isle Theseus unwitting left. The Wine-god [Dionysos] brimmed with nectar these, and gave them to his son; and Thoas at his death to Hypsipyle with great possessions left them. She bequeathed the bowls to her godlike son, who gave them up unto Achilles for Lykaon's life. The one the son of lordly Theseus [Akamas] took, and goodly Epeius sent to his ship with joy the other." "Poets have sung, and the tradition of men has followed them, that Hephaistos made many works of art, but none is authentic except only the scepter of Agamemnon. However, the Lykians in Patara show a bronze bowl (krater) in their temple of Apollon, saying that Telephos dedicated it and Hephaistos made it, apparently in ignorance of the fact that the first to melt bronze were the Samians Theodoros and Rhoikos." "[Hephaistos learnt of his wife Aphrodite's adultery :] He laid the great anvil on its base and set himself to forge chains that could not be broken or torn asunder, being fashioned to bind lovers fast. Such was the device that he made in his indignation against Ares, and having made it he went to the room where his bed lay; all round the bed-posts he dropped the chains, while others in plenty hung from the roof-beams, gossamer-light and invisible to the blessed gods themselves, so cunning had been the workmanship . . . Once he had seen Hephaistos go, he himself approached the great craftman's dwelling, pining for love of Kytherea [Aphrodite] . . . So they went to the bed and there lay down, but the cunning chains of crafty Hephaistos enveloped them, and they could neither raise their limbs nor shift them at all; so they saw the truth when there was no escaping." "[Ares and Aphrodite were] trapped in the myriad-meshed toils of Hephaistos." "When Volcanus [Hephaistos] knew that Venus [Aphrodite] was secretly lying with Mars [Ares], and that he could not oppose his strength, he made a chain of adamant and put it around the bed to catch Mars by cleverness. When Mars came to the rendezvous, the together with Venus fell into the snare so that he could not extricate himself." "[Upon learning of Aphrodite's adultery with the god Ares :] Volcanus [Hephaistos] . . . at once forged a net, a mesh of thinnest links of bronze, too fine for eye to see, a triumph not surpassed by finest threads of silk or by the web the spider hands below the rafters' beam. He fashioned it to respond to the least touch or slightest movement; then with subtle skill arranged it round the bed. So when his wife lay down together with her paramour, her husband's mesh, so cleverly contrived, secured them both ensnared as they embraced." "Of the gods, the people of Khaironeia [in Phokis] honor most the scepter which Homer says Hephaistos made for Zeus, Hermes received from Zeus and gave to Pelops, Pelops left to Atreus, Atreus to Thyestes, and Agamemnon had from Thyestes. This scepter, then, they worship, calling it Spear. That there is something peculiarly divine about this scepter is most clearly shown by the fame it brings to the Khaironeans. They say that it was discovered on the border of their own country and of Panopeus in Phocis, that with it the Phokians discovered gold, and that they were glad themselves to get the scepter instead of the gold. I am of opinion that it was brought to Phokis by Agamemnon's daughter Elektra. It has no public temple made for it, but its priest keeps the scepter for one year in a house. Sacrifices are offered to it every day, and by its side stands a table full of meats and cakes of all sorts." "Poets have sung, and the tradition of men has followed them, that Hephaistos made many works of art, but none is authentic except only the scepter of Agamemnon . . . probably the scepter is the only [genuine] work of Hephaistos [i.e. of the various relics on display in Pausanias' day which were attributed to the god]." "The vine which the son of Kronos [Zeus] gave him [Laomedon] as a recompense for his son. It bloomed richly with soft leaves of gold and grape clusters; Hephaestus wrought it and gave it to his father Zeus : and he bestowed it on Laomedon as a price for Ganymedes." "Herakles was stumped by the problem of driving the [Stymphalian] Birds out of the woods, but Athene got some bronze noise-makers from Hephaistos and gave them to him, and by shaking these from the mountain adjacent to the lake he frightened the birds." "Polytekhnos, when he [was] changed [into a bird by the gods], became a woodpecker because Hephaistos had given him an axe for his work as a carpenter. This bird is a good omen for carpenters."